The Black-winged kite or Black-shouldered kite (Elanus caeruleus Desfontaines, 1789) is a small and elegant bird of prey belonging to the order of the Accipitriformes and to the family of the Accipitridae. Even if placed in the group of the kites, it would be difficult to find at first sight some relation between these ones and this small and elegant bird.The flight, the posture and the way of hunting are surely quite distant from his cousins the Black kite (Milvus migrans) and the Red kite (Milvus milvus) moreover, the colouration detaches markedly from the compact brown of the last ones evidencing a variegated and well evident livery. Already from the vulgar names given by the various countries that have classified it, its colouration rather different from the usual undertone livery is evidenced. There are those who have called it white, others black, others light blue, but actually its livery is precisely described with very few colours. 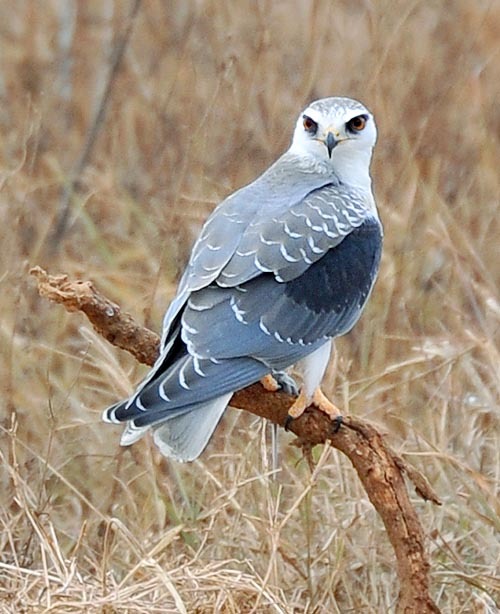 In English it is called Black-shouldered kite; in French, Élanion blanc; in Spanish, Elanio azul and in German, Gleitaar. For what its scientific name is concerned, the genus Elanus comes as usual from the Greek, from “elanos” = kite and the specific caeruleus means light blue in Latin. It is a bird difficult to be mistaken when well observed, though many males of harriers (Circus sp.) have quite a similar livery, but a careful analysis of the flight helps immediately in identifying its species. First of all, this bird has a compact structure with remarkably shorter tail than the harriers and furthermore is one of the birds, along with our kestrel more practicing the “Holy Spirit” while hunting. 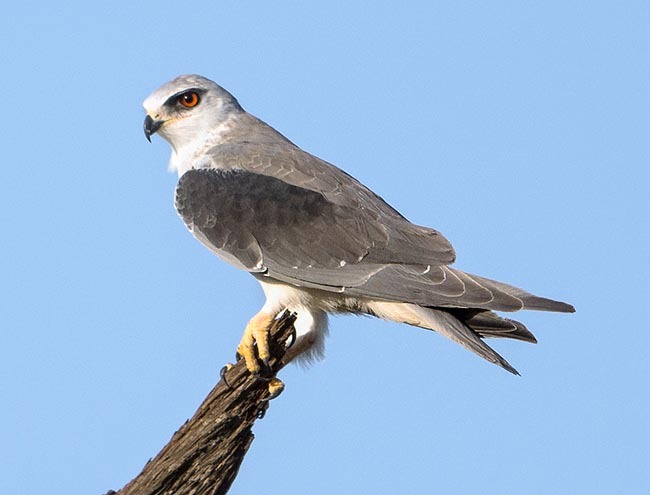 Moreover, contrary to the harriers that always perch on the ground, and only seldom on small shrubs, the black-winged kite prefers obsessively staying on high branches of dried trees or, where available, on electricity poles from where it does the wait hunting. It is a bird that does not go unnoticed due to its whitish colour as well as for the continuous fluttering in open areas and often along the communication routes. 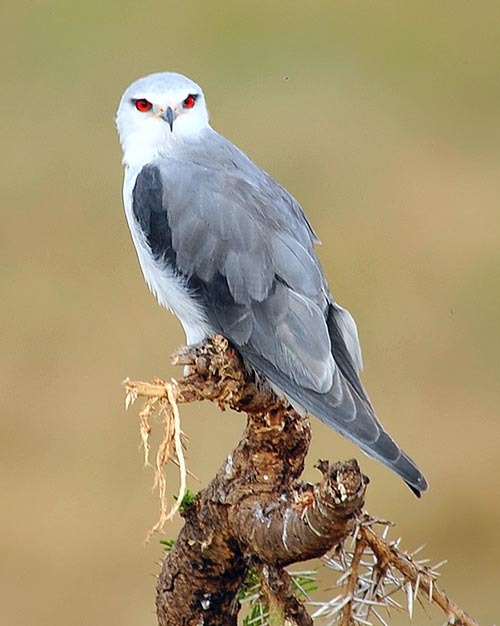 The Black-winged kite has a very vast range covering all sub-Saharan Africa and North-Western Mediterranean, including the Iberian Peninsula. It also lives in the Nile valley and all Indomalayan Asia to reach south-eastern Asia and getting close to Australia. It is absent in the area going from the Asian coasts east to Mediterranean up to Pakistan. Some subspecies recognized by man at level of species do exist, in particular the populations living in the most remote areas of its range. 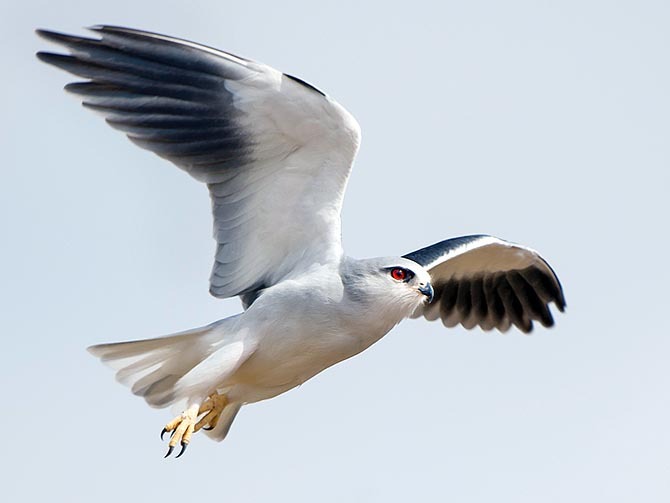 In these zones live the Australian black-shouldered kite (Elanus axillaris) and two subspecies : the Elanus caeruleus vocifer in the south-eastern part of its range and the Elanus caeruleus hypoleucus in the extreme south-eastern Asia, whilst the Elanus caeruleus caeruleus is the nominal subspecies present in Europe and in Africa. Also Americas have a species quite similar to our kite, the Elanus leucurus for long time considered of the same European species. Presently the population of this raptor enjoys of good health and keeps a population stable and even we assist to a slow but continuous widening of the European range. This species is not considered as migratory though in the tropical areas we see movements even far away but it is thought that these are done by juveniles or by entire populations during the alternation of the rainy seasons and in any case always due to the research of food. Concentrations of many individuals may occur during the Palearctic winter season or the dry one in the tropics but due to the habit these birds have to gather in huge number in dormitory places more than for the migration. As a matter of fact, during the period after the nidification, these birds become extremely sociable and form quite consistent groups. It is calculated that the overall population amounts to several million of individuals. 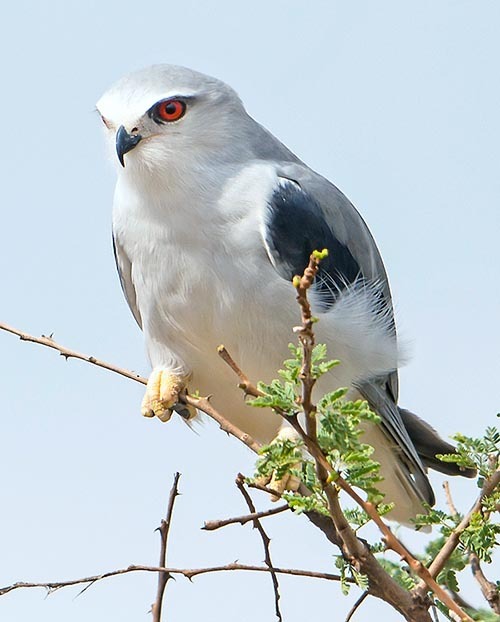 The black-winged kite has a fairly vast habitat even if it prefers in absolute semi-desert areas with low bushes and grass surfaces where its preys do hide. It also frequents inhabited areas getting often in contact with human beings whose presence is not feared. It arrives up to the edges of forests but it never enters heavily wooded areas as it prefers open areas with wide view and sparse trees where to go hunting. Its evident livery and the open vision of the frequented areas renders possible to remark its presence immediately. Even if frequenter of savannahs, it does not disdain to travel to high altitudes reaching even the 3000 m on the African highlands as well as on the Asian ones. It nourishes of rodents, reptilians, insects and also of small terrestrial birds. The innate ability of keeping suspended flying in mid-air, even at thirty metres from the soil, highly facilitates the detailed scanning of its territory, but loves also very much remaining perched on the electric wires, on the poles or any other support giving room to its careful and precise sight, for swooping, with ajar wings directly on the prey seizing gthe same with its powerful claws. In some rural areas it suffers from the indiscriminate use of pesticides spread for limiting the number of rodents damaging the crops. Like for the long-crested eagle (Lophaetus occipitalis) also this raptor seems to be often affected by the ticks that frequently disfigure its face up to the blindness. When adult, the white is the base colour of its livery. A light bluish white spread on all the rump becoming even whiter on the chest, the tail and the underwing. As evident contrast, the shoulders and the remiges are of a quite strong black colour that highlights from afar the livery. Also the head is white with black eyebrows and bright carmine eyes in strong contrast with the black colour of the pupil. For its size the eyes are very large and are located frontally like in the night raptors, this is to facilitate the binocular vision that is so much necessary for its hunting. Indeed, this bird benefits of this characteristic also for hunting in the twilight hours of the sunset or early morning. The black-winged kite has a wingspan of about 90 cm, a weight around the 200 g and an overall length of 30 cm. There is a slight sexual dimorphism between the adults where the male is slightly paler. The young are slightly darker and the white is replaced by a suffused gray tending on the chest to a slight ocher color. The legs are bright yellow with black claws. Contrary to the kites we know, the tail is not bifurcated but squared and not too long. In fact, the wings, rather long and tapered, when resting, protrude from the tail of some centimeters. Seen the immense vastity of the diffusion area, the Elanus caeruleus can practically nest during the whole year. In some areas subjected to the seasonal rains, it follows the trend of the rainy period, in others, particularly in the Palearctic, the choice falls on our summer season. The nest is built on high trees possibly on the highest branches and is a rather reduced structure, formed by dry twigs covered by softer material inside. It places the nest usually between the 3-4 m and up to more than 20. It is very regular and the regularly rebuilt new nest is often placed again on the same tree where has previously nidified or on other trees always very close. Silent bird during the whole year, only during the reproductive season emits whistles during the courting and the defence of the nesting territory. They lay three to four eggs, of cream colour spotted of brown that are hatched for little less than one month, by both sexes but mainly by the female. At birth and during the first times, the female keeps constantly on the nest and the food is furnished by the male. The young stay in the nest for about 5-6 weeks even if for a short period after the fledging they are still assisted by the parents. It has been ascertained that during particular seasons rich of preys, this kite can nidify continuously also during the same season.